Over the last couple of months, I have been writing about our first foray to the east in December 2014, and most of my posts have been about our trip to Sikkim. These posts have generated quite a bit of interest, and I have been flooded with questions about it, which is why I have decided to write this post as a compilation of my experience there, as well as answers to lots of questions I have been asked. We stayed at the two Club Mahindra Resorts in Sikkim – Baiguney and Gangtok. It was the obvious choice, since we are members, and among the two, it was Baiguney that we loved. The river runs right along the property, and we spent hours by the river just sitting and watching birds, reveling in the silence. Having said that, Sikkim also has many homestay options, and if you are planning a trip, do check them out. Our trip to Baiguney was meant to relax, since we had already been travelling for over a week. On our first day, we did little more than relax, except for walking down to the river and trying to spot birds! We woke up early in the morning on our last day in Baiguney to see a spectacular sunrise over the Kanchenjunga. You can read about it here: Sunrise on the mountains of Sikkim. We next headed to Gangtok, passing Namchi on the way, and stopping to visit the many temples here. You can read my thoughts on the huge statues of Namchi in this post..
And one, about the sleepy felines in the zoo! I have written about our visit to the Monasteries of Gangtok – Gonjang, Enchey and Rumtek Monasteries. Our last stop that day was the Do-drul Chorten. The Institute for Tibetology has a museum with artifacts relating to Tibetan history, mythology, culture and religion. There are some amazing works of art here, from the intricately embroidered Thangkas as well as ritual objects. On display are also remains of the earliest Buddhist missionaries from Ashoka’s times! This is a must-visit, especially to understand the art and stories behind all the monasteries we visit in Sikkim. Why haven’t I written about it? Because, apart from one photo of the entrance, I have none (since photography is prohibited) and I am waiting till I learn a bit more about Tibetology to actually write about it. The markets, which I so enjoyed, I completely forgot to click pictures! On our second day in Gangtok, we managed to get a permit, and headed towards Nathu La. I have written three posts about this trip..
Baba Mandir – the story of a soldier-saint. On our third day, we took it easy, and headed to the Rumtek Monastery, which I have already written about with the other monasteries…. And took an early morning ride on the ropeway, which gave us a lovely view of Gangtok. The next day, with the fog rising and the rains pouring down in the mountains, we made our way back to Bagdogra, and flew back home. It is best to hire vehicles from Sikkim for excursions around the state, since there are vehicular entry restrictions at various places. Pemits are needed for Nathu-La. We had our permits arranged by the resort. A day’s notice is needed, but if there is no unusual crowd, permits are easily available even from the tourism offices. The roads are bad, and even a short distance takes a long time to cover, especially if repair work is going on, or if there is a landslide somewhere (which is quite common) Be prepared to spend a long time in your vehicle on every trip! There is a helicopter service available from Gangtok to Bagdogra. The flight takes off on regular timings, provided the weather permits. If you plan to use the service, make sure you travel light. Only 10 Kg per person is permitted. If you want to explore West Sikkim, it is best to stay at Pelling, or even better, at one of the homestays near Yuksom. There are plenty of trekking routes here, and even if you don’t plan week long walks, you need at least a few days to enjoy this region. To explore North Sikkim, plan from Gangtok, with stays at Lachen and Lachung. There are homestays here too. You need permits, so make sure you have all your documents. There are short, 3 day tours here, but to really enjoy the place, you need to keep another week aside. In about a week, we managed to cover only bits of Sikkim. We didn’t step anywhere into North Sikkim, or even South Sikkim. Many of you have asked me why we didn’t visit North Sikkim, which is so much more beautiful. The reason is simple. This was my first trip to these heights, and I had Samhith along with me. We decided to take it easy on this first trip, so we could gauge just how well our bodies adjusted to the altitude and the weather. As it turned out, it was a good decision, since neither Samhith nor I reacted well to the high altitudes. Both of us fell sick in spite of having medications, and struggled with the weather too. It was only by God’s grace that neither of us fell really sick, though a couple of kids in the resort did, and had to be rushed to hospital. We meant to have an easy, relaxed trip, and we did. Could we have done more? Probably. Maybe next time, when we are better prepared, both mentally and physically! 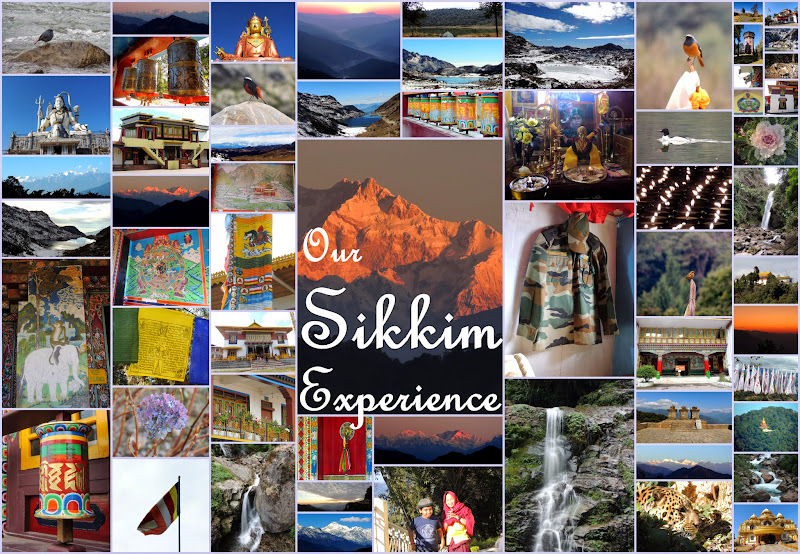 I hope this post is useful for those of you planning your own trips to Sikkim. Please do not hesitate to write to me if you have any more questions. You know what Anu? One more trip there and you can compile a book! The posts are detailed and so well written. Lovely wrap-up, Anu! Thank you for your insights into the area. I really enjoy them. I like Nisha's idea about a book, especially if it included your favorite pictures! You've gotten some amazing landscape and bird photos on your travels. Very nice article, you are very good travel writer. It must have been an amazing trip! Those are some great pictures, will try to make to Sikkim this year. It has been on our bucket list for a while now, must get a move on the planning! Thanks for the helpful tips and list of places to visit!